I got my new Stamp Sets in the mail this past Friday and got to play a bit. 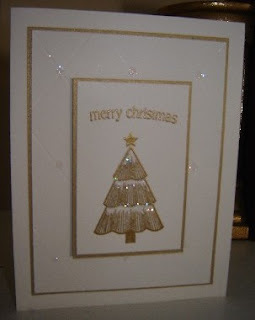 Here is a simple but elegant card I made with the tree from "Christmas Classics". This is such a fun set to work with. It's one of those sets you can dress up or down.....fun, fun, fun! Access: 2-Way Glue Pen, Dazzling Diamonds and Gold Embossing Powder. I also did some cross-hatch dry embossing on the white background. This little touch adds to the elegance of the card, especially with a dab of diamonds at each cross hatch. (Thanks Sharon for teaching me this technique). I hope you enjoyed this card today.....it will be one I offer in a Kit soon. love the simplicity of this card...gorgeous! Lee, this is my favorite Christmas card you have made so far! I love it! The extra sparkles make it perfect. This is so elegant. Beautiful!